The most fun you’ll ever have reading a brewing book! In Radical Brewing, Randy Mosher combines his passion for brewing with his deep knowledge of the craft. He covers the history of beer and brewing, the ingredients of brewing, and the methods for using those ingredients. It is full of interesting facts and details you may have never heard before. Enjoyable, not tech-heavy. Not a beginners manual, more a deep dive into beer making and its history combined with a love of the craft. Gives you a unique insight into beer making that is sure to get your creative juices flowing! There are several books available that teach technique and procedures for brewing. This one provides mounds of inspiration and creativity. I would highly recommend this book for any intermediate brewers looking to move beyond the standard porters, pale ales, brown ales, etc... and come up with something unique. After reading several tech-heavy books and doing my best to muddle through the math, it was so refreshing to read about the art of brewing from the perspective of a creative person who understands and respects brewing history and culture. Learning the origin of techniques we use in brewing today helped me understand the processes (and even the math!) more completely. This is an enjoyable read that's full of interesting ideas and unique recipes. It'll help you think outside the box. That said, I don't come back to this book as others on my homebrew shelf. I'd probably buy it again, but it's not the most valuable of the many good resources out there, unless radical brewing is your main goal. In that case, it's among the best, since it pushes the boundaries but in reliable and tasty ways. The author has a nice sense of humor so its fun to read. Skip the first quarter of the book, it's a rehash of brewing technique. But the rest of the book is great, covering a variety of ingredients, and proving some good recipes. I'm a very analytical person, and Randy Mosher really helped me open up my creative side with this book. Its still a wonderful reference when putting together any beer. Great descriptions of malt, tons of recipes, awesome advice on adding fruit, spice, and general "wow factor" to your beer. A Must for any Brewer's Library! This book is packed with recipes, history and information on beer throughout history. It is packed with great photos as well. Whenever I am looking for something different to brew, this book is my first stop. Within this book I am bound to find an uncommon style or an "old" twist on a beer that is currently being brewed. This is a must have for any brewer truly interested in reading and learning about the beer brewing craft. It is best read after the Papazian and Palmer manuals (after one has gained the basic knowledge behind brewing). 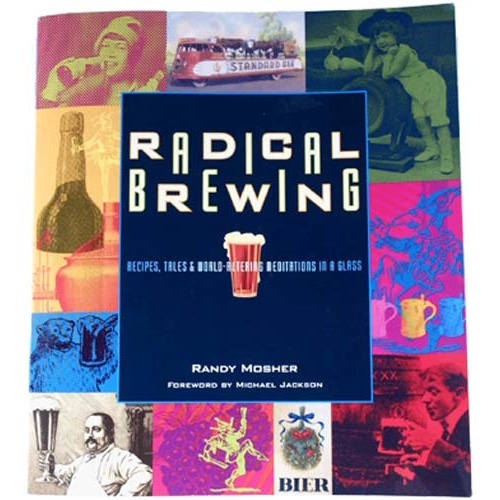 Full of history and great recipes, "Radical" illustrates the true art, craft and imagination behind great beer brews. It is a steal at this price!